My bedstead designed in the style of a 17th Century full paneled tester bed. (early digital camera picture). I have begun the restoration of my bedstead and I am very happy because it has been a long time coming. I built the bed 18 years ago in one of my apartments in Savannah. It took a long time to build and when I applied the first coat of stain the odour was so bad I could not complete it. For 18 years the bed has had what I call an undercoat stain of Red Oak. The plan being, a final coat of English Chestnut over the Red Oak, but it was never completed and this has annoyed me to no end. In time the bed ended up in storage for about 4 years due to travel and future apartments with low ceilings. When I moved to North Carolina the bed once again went into storage and was damaged in the process. It finally was taken out of storage and used for a time in the last home I rented and finally, when I purchased my current home it was moved into storage again for the purpose of restoring. What drove me to build such a bed, you ask? 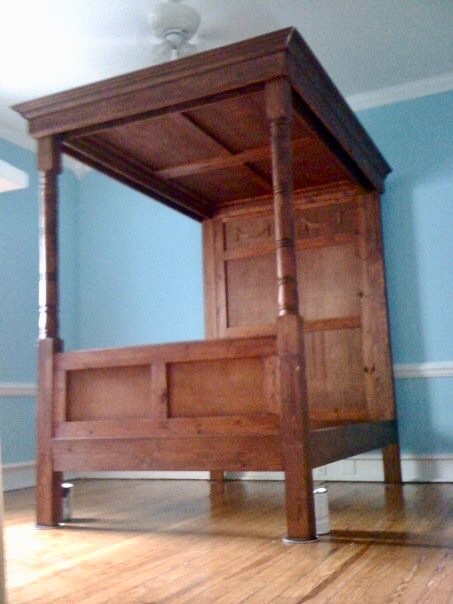 I have always admired cabinet beds and full panel tester beds from the 16th and 17th century. I suppose the grandness of it, though not all of them were grand. The design served a purpose to keep the occupant draught free. In those days, if you caught a cold you could quite possibly be dead in a short amount of time. For me though, it was for the drama. Examples of these types of bedsteads do exist at various historical sites throughout the former American colonies, but generally you will not find them for sale anywhere and if you could it would be very expensive. However, you can regularly find them in antique shops in the United Kingdom, especially in England, but they are still expensive and extremely so to have shipped. Example from Period Oak Antiques, U.K. I originally copied a similar foot board to this one from 1661.Period Oak Antiques, U.K. Faced with a wee budget, but a creative mind I set out to build my own. I did research on their designs mainly by reading a history on beds and visiting antique shops online looking at photographs. I then sketched out my ideas and paired them down as elements I had originally wanted were cost prohibitive. I then stared purchasing the materials and set to work constructing the bed in my bedroom in my apartment in late 1999, completing it in early 2000. It was quite an adventure as I never had built a piece of furniture before. In the end I realised I should have built it in smaller parts and of less heavy materials. It is very, very heavy! However, I am happy that I managed to hold on to it all these years. As of now I have begun with the headboard, lightly sanding it and applying an English Chestnut stain. I have completed two coats and am deciding if I should apply a third coat. Headboard with two coats of English Chestnut. Has anyone worked with Tung oil? I heard it is horrid. As in extremely potent in smell, sticky and gooey. I am not sure I am going to use it on the finished product due to these reasons. Also since I never made furniture before I did not know what I was doing and used a variety of inexpensive wood. Some of it is rough even when sanded so the idea of rubbing in Tung oil does not seem like the best option. It’s going to take me awhile to finish staining all the pieces so I have time to decide, but I may end up using a satin finish polyurethane.